The season may have started but it is not too late to refine your skills or even jump into a race for the first time. With daylight waning and organized cyclocross practices starting to dry up, one way to give those skills a little boost going into the home stretch of your season is to get some fresh instruction and inspiration. 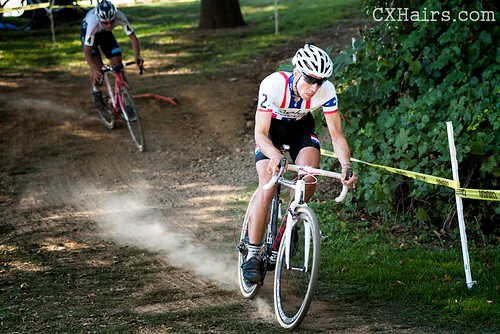 I checked out the new cyclocross skills DVD by U.S. National Cyclocross Champion, Jeremy Powers (Rapha Focus), to see if it hits that mark. The video is divided into about 10 sections that walk you through the race day. From packing your gear bag with all the necessary clothing and dialing in pre-race nutrition, to navigating barriers and even successfully performing a bike exchange, the video touches on the essentials and more. That being said, the video is not all encompassing. It shows you the techniques Jeremy uses that make him better. If you are watching closely, you will have more questions. And that’s not a knock on the video but rather a sign it’s doing its job of teaching. Learn the basics here, and then seek out other resources to help refine those baseline skills. There are a couple areas in this video—how to pack a bike or communicate with your pit crew, for instance—that are definitely not meant for the beginner. None of these areas, however, deal with skills or technique, which I would argue is the most valuable part of the video. Likewise, don’t be overwhelmed by the amount of clothing Jeremy brings to a race. What he sets forth is definitely a best case scenario and one made easier when your title sponsor is providing your race clothes.